In a separate paper it was concluded that WWI was not necessarily ‘neutral’ concerning the weather. Particularly Britain, surrounded by naval warfare over four years, showed strong indication that its weather had been influenced by numerous military activities at sea as far as temperatures and snowfall were concerned. Temporary weather modification seemed to be evident. This paper shall go beyond the question of weather modification. This paper further proposes to look for clues that may explain why a sudden, extreme and lasting warming occurred in the high North of the North Atlantic, as recorded at Spitsbergen since 1918. This ‘Severe Warming’ in the North led to the first significant climatic change during the 20th century, lasting for twenty years until the winter of 1939/40. The second dramatic climatic change during the last century started 1939/1942. The Severe Warming at Spitsbergen 1918 and the continuation thereof must have a cause. There was nothing around Spitsbergen, in the East, the North and in the West, that could have initiated such a sudden rise in temperatures at Spitsbergen. The only pathway to receive temperature-generating masses was the ocean water coming from the South, via the Spitsbergen Current and the Norwegian Current, but at the beginning of these currents lie European coastal waters. These waters around the Isles of Britain, composed mainly of the warm Atlantic Gulf Current, had been the principal sea battlefields since World War I had started in August 1914. The following presentation shall provide a basic idea of the forces and destruction that had been unleashed over a relatively short period of time. The forces had been so huge that one can go on saying: No drop of water of the Western Approach (Ireland, English Atlantic coast), the English Channel, and the North Sea from Dover to Shetland Island had been left unturned. This water from the battlefield eventually flowed northwards with the currents. The composition and temperature structure of the seawater that arrived in the North was no longer ‘natural’. Considerable parts of the water had flowed into the Arctic Basin; other parts may have circled in the Northern Atlantic (Norwegian Sea) for many years. This section provides the necessary information on how extensively the war machinery interfered with ocean and seas, water and the current system. 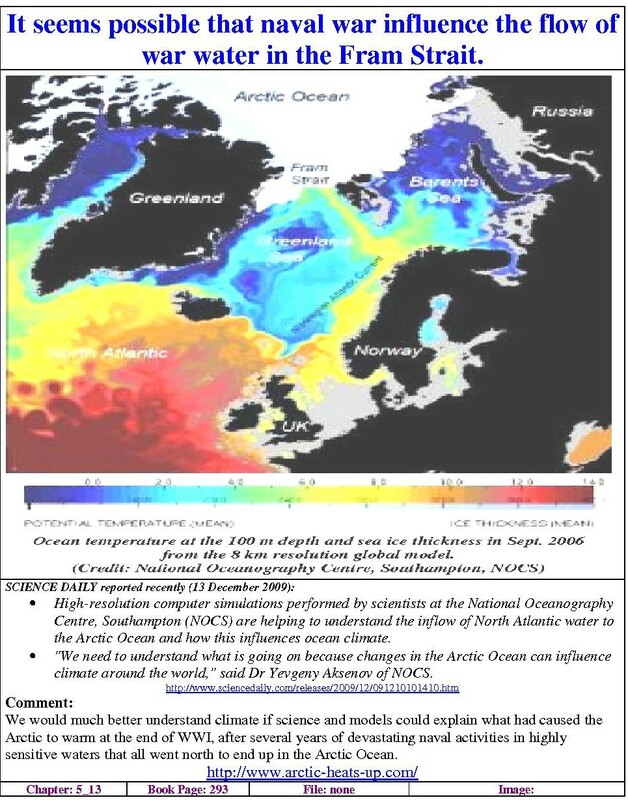 As no other reason has ever been convincingly named for the sudden warming at Spitsbergen in 1918, and as the warming remained stable for two decades, the water at sea in Western Europe as the basic cause for this warming is an extremely plausible explanation. 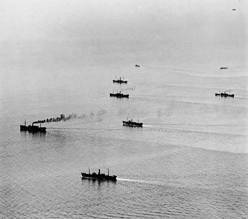 Although WWI lasted for four years, the war at sea went into full gear only in autumn 1916. The Germans had recognised the power of the U-boat as the most effective naval combat vessel. 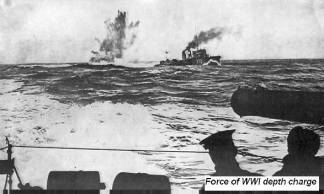 Both the British and the Germans realised the need and equipped themselves for sea mine warfare. The British also returned to the 19th century concept of a convoy system and had a newly developed anti-submarine technique at hand, viz. 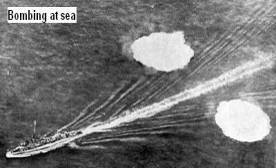 the depth charges. The war reached its highest stage in 1918, when a huge sea mine barrage was laid at the northern entrance of the North Sea. · The period from 1914 – 1916 will give some general impressions on the situation. · The period from 1917 to the end of the war in November 1918 will particularly focus on the enormous destruction to man, materials and the radical turning about of the seas by the war at sea. A later chapter will deal with sea mines and the Northern Barrage. This paper is not a historical naval warfare account, nor does it aim at being complete. Further facts should be obtained elsewhere by interested parties. “The whole story is told by Mr. Winston Churchill in the World Crises, 1911-1914, Vol. I, p. 467. Squadrons and flotillas were moved to deal with the expected raid, and these forces actually made contact with the enemy during their retreat and opened fire. At one point the British and German battle-cruiser forces were only twenty-five miles apart, and were still closing in on each other. Further seaward there was a powerful battle squadron under the command of Sir George Warrender. The action was imminent, and it could only have one result. Then, as it so often had happened before, the weather supervened. The wind sprang up and the sea started to run high. The North Sea mist came down until the horizon became blotted out in a curtain of thin vapour. The weather gradually thickened, the visibility dropping from 7,000 to 5,000 yards, then to 3,000. In the driving rain-squalls the area of vision was bounded by a circle whose radius was sometimes less than a mile. 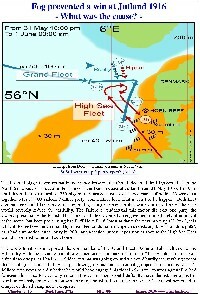 REMARK: The sea area mentioned is off the coast between the lighthouse Flamborough Head and Newcastle. In a short distance from the coast the water depth reaches 60 metres and more. In December the means temperature of the water body is almost homogeneous at about 8°C. The surface layer may already have been considerably cold. Possibly a number of four dozen big ships moving fast around and shelling at each other, is as effective as the spoon in the hot soup cup, stirring nervously. Encounters, as at Hartlepool in December are the way naval forces can influence weather. In naval history presumably nothing has so extensively been documented and described as the Battle of Jutland in May 1916, and no action of any two commanders has been more painstakingly analysed concerning strategy and leadership. In most general terms one possibly could say the outcome was at on par. What has not yet been considered is whether it was reasonable to have mobilised such a huge armada of naval vessels against its enemy at the time of the year and at the location in the first place. Actually, in all respects the encounter was neither won nor lost by any of the combatants due to dust, mist and later fog. 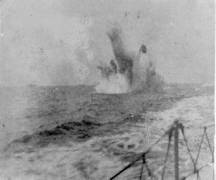 Neither of the fleet leaders, the Admirals Jellicoe and Scheer, had been prepared for this. Either of the Admirals could have won the battle if he had been advised that such a huge armada of ships, fighting and moving, would inevitably reduce the visibility in the sea area very quickly to the lowest level, by dust, mist or fog. 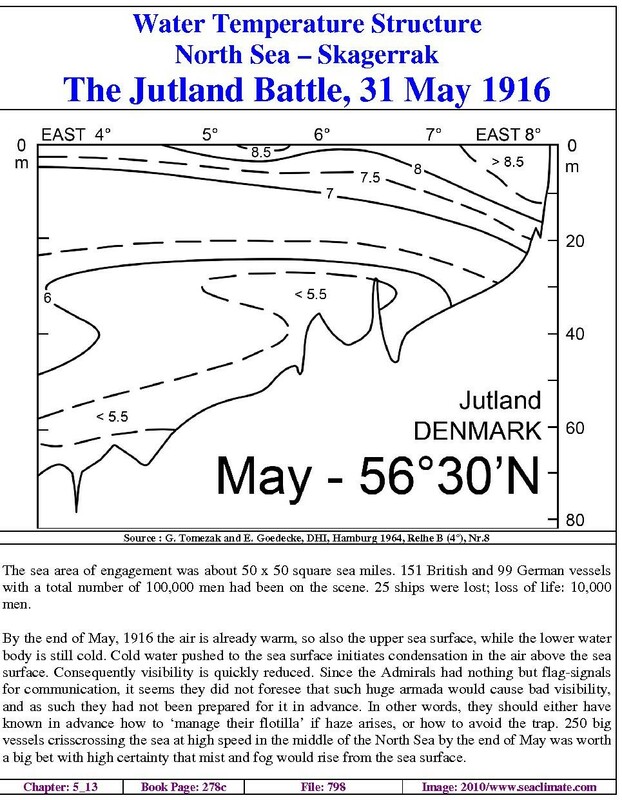 By the end of May, 1916 the air is already warm, so also the upper sea surface, while the lower water body is still cold. Cold water pushed to the sea surface initiates condensation in the air above the sea surface. Consequently visibility is quickly reduced. Since the Admirals had nothing but flag-signals for communication, it seems they did not foresee that such huge armada would cause bad visibility, and as such they had not been prepared for it in advance. In other words, they should either have known in advance how to ‘manage their flotilla’ if haze arises, or how to avoid the trap. 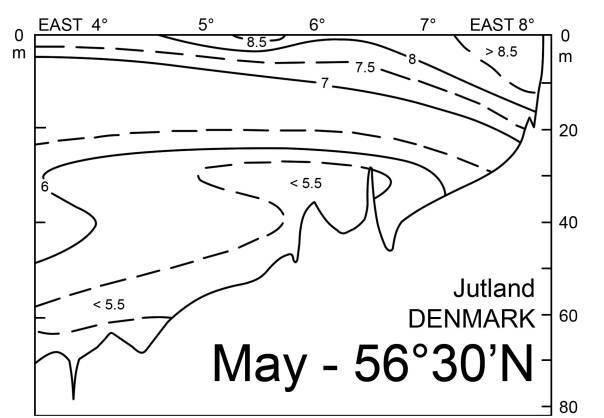 250 big vessels crisscrossing the sea at high speed in the middle of the North Sea by the end of May was worth a big bet with high certainty that mist and fog would rise from the sea surface. The sea area of engagement was about 50 x 50 square sea miles. 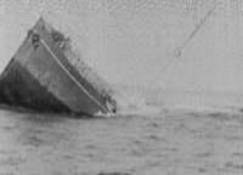 151 British and 99 German vessels with a total number of 100,000 men had been on the scene. 25 ships were lost; loss of life: 10,000 men. 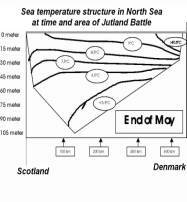 By raising the point of ‘fog and mist’ during the Battle of Jutland may only illustrate that the naval armadas had influenced the weather, and that this presumably prevented one of the two Admirals to win. However, any influencing the weather beyond the battle will not exist. For climate the biggest sea battle of surface naval vessels in Europe’s waters of all times, will have passed unnoticed. But not so many thousand naval activities every day as long as the war lasted. Down in the English Channel, the tanker Conch loaded with 7,000 tons of benzene was torpedoed, which burned like a giant torch. The explosion blew the after-tank top off and showered the bridge and superstructure with blazing oil. Engines were kept running to prevent blazing oil from collecting round the ship. Steaming onwards, unmanned but still blazing furiously, she foundered next morning. Another example: U-boats were a problem to the British. In June 1917 its shipping loss rose to over 680,000 tons. For this reason four flotilla leaders, with some 50 destroyers and seventeen submarines were sent to an area stretching from NW of Stornoway, round to the north of the Shetlands and eastwards into the North Sea between the 15th and 25th June 1917. The idea was to force the U-boats to the surface and attack them. On sixty-one occasions U-boats were sighted and were attacked twelve times. In practice that presumably meant, that during the operation of 75 naval vessels many hundred depth charges had been dropped, in addition to some shelling. No U-boat was sunk. This episode demonstrates that huge operations in the sea may have taken place, which did not go by without any impact on the sea area. However, these were not accounted for in relation to climate change. · The value of mean winter temperatures, which match some of those from the record winter 1939/40. · The extraordinary similarity in years of snowfall, time period of snowfall, quantity of snowfall and days of snowfall. · The very extreme three cold winter year ‘package’ 1939-1942; also the three winters 1915-1918 were relatively cold and form a ‘package’ that may serve as an indication for not being ‘necessarily usual’.